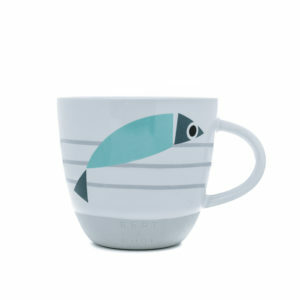 This designer mug features fish made up of three distinct parts coming together to kiss. Created from stained porcelain to have a capacity of 350ml, this nautical mug is presented in a designer gift box with individual gift tag. Distinctive of the Bert & Buoy ceramics collection, this nautical mug features two colourful fish which can be found in huge shoals on the South Devon coast. It was created collaboratively by Master Potter, Keith Brymer Jones, and Designer and Illustrator, Bert Fowler. 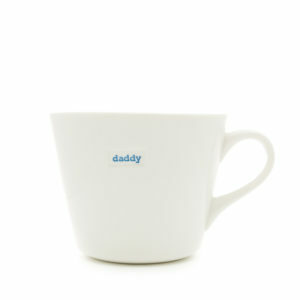 Featuring a decorative brand stamp, exposed glaze line and quirky unglazed base to mimic a beach pebble, these mugs are dishwasher and microwave safe. Each illustration was originally sketched by Bert Fowler in his South Devon studio before being transferred onto a uniquely shaped and designed mug by MAKE’s Head of Design, Keith Brymer Jones. This Fishy Love mug is striking enough as a solo piece however looks great accompanied by the Fishy Line-Up and Fishy Rise & Shine mugs as well as the rest of the collection.